One would expect a book on miniatures to target a specific audience, but Garfield offers a holistic look, broadening the concept of miniature, from souvenirs and model planes / ships to tiny books and staged crime scenes. In a surprise opening, Garfield shares the psychological obsession with recreations of the iconic Eiffel Tower, some models larger than a person, so not an expected miniature, but still tiny versions of the beloved landmark. He moves on to intricately detailed and blue-printed miniature villages and cities of astounding square footage. And from there, Garfield flies high to explore tiny portraits of royals and young Queen Mary’s dollhouse, for display only. More surprises enchant the reader upon finding out the rockstars who also happen to be model train fans, architect models famous for the intended structure not being built, and the elaborate theater that was, Garfield meandering out to mini stage sets. The book wraps up with a microscopic matrix-like painting within a painting within a painting, micro-sculptures, and of course, rice drawings and eye of the needle scenes, but also mini-cooking YouTube videos and contemporary artists. 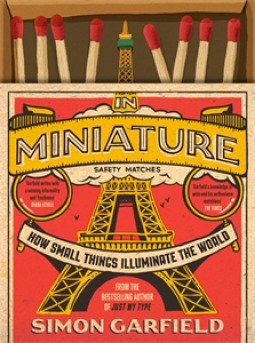 The Epilogue wanders through popular culture’s take on miniatures, and a retelling of Prussian victory at Waterloo, the final note an 8” 3D Mini-Me of the author himself. At the end of every chapter is a “mini-break” enlightening readers upon such obscure miniatures as Egyptian shabtis, slave ship models, flea circuses, floor games / play rooms presaging Simcity, LSD tab art, Temple of Jerusalem, Las Vegas’ idea of world culture reduced to a resort, a shock artist’s work, and designer chair samples. Extensive research was done for this book, with thorough timelines, respectful interviews, and photos. Garfield describes the inspiration, effort, finances, and passion involved in all aspects of the miniatures he’s investigated, relaying the history as a storyteller. The book is global in its scope and astonishing in its depth and content, a fun read for anyone interested in extraordinary things, reminiscent of The Museum of Interesting Things in NYC. I received a copy of this fascinating book from the publisher Atria Books through NetGalley.